Those of you who have been following my blog may have already heard me sung high pitched praises for the book 'Eat, Pray, Love' by Elizabeth Gilbert, which has inspired me to go on a new journey of discovery and healed my grizzly wounds in ways that I can not explain with words alone. It is perhaps by coincidence that I completed the book towards the end of December, but the feeling of a new beginning could not be more true. As I put the book down after the final page a question came into my head; "So what did you learn?" The plethora of ummmmsss and aaahhhsss from my thoughts could have danced across pages and pages of the new year as I continued to seek my one conclusion. The book had stirred a series of emotions within me and I knew I had to write a review on it.....it is the desire, the passion and the gratitude that moved me so strongly. You only have to take a peek at the number of glowing stars on the Amazon reviews to know that it is a highly recommended read, and so I will not bore you with empty praises, but instead I will try to express why this book has resonated echos within me long after the final page. The crucial ingredient is of course empathy, which as most of us know, can be filled with personal biases....but it is also the sharing of experiences and the stimulation of ideas or theories that captivated me to continue the journey with Elizabeth Gilbert. Despite my Malaysian roots I have never been to India or Indonesia, but from my own love of yoga and meditation in the journey to seek balance.....to some heartbreaking events and experiences of losing oneself that threw me off this dedicated course called life......I knew her feelings were true and admired her courage to seek peace within herself at all costs. To find that balance within yourself once may not be the most difficult task, but to keep within that balance throughout life no matter what is thrown at you is the crux of the biscuit. 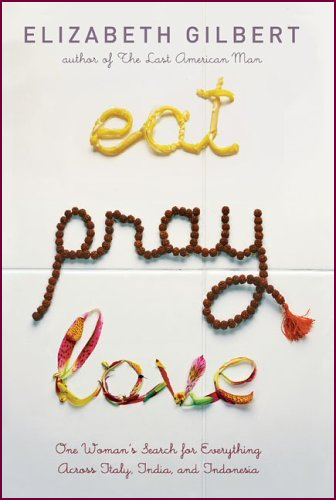 The Film ~Eat, Pray, Love~ with Julia Roberts. What I liked about the book was that it was not just a story about a woman lucky enough to be trotting the globe for a year, but there were ideas and information about culture, religion, lifestyle, people or places for the readers to learn or explore. Not many may know why Buddhist prayer beads have 108 main beads to symbolize perfection, or how the Balinese see all new babies as Gods of pure goodness who must not touch the ground until the transition to humanness. Many who are new to meditation often ask me what I gain from it or how hard can it be........but for me these are not the questions I ask myself. I simply meditate because I want to, and I feel a sense of balance because I meditate. Stilling the mind in meditation does not mean that you cut out every single thought until you feel empty......the mind often functions and runs like a wild horse, so to stop it in its track will be unnatural and forced. Meditation therefore requires listening to your mind openly and reaching an acute awareness of your wild horse....this is the focus, essence and hard work that I felt Elizabeth Gilberts was able to depict accurately in the book. The film by Julia Roberts on the other hand was a different matter, and I was left disappointed as well as dissatisfied with her adaptation of the book......as she was unable to capture the essence of Gilbert's courage, the thirst for the discipline of yoga, or even the vibrancy of different cultures that she brought to life in the book. The character and events that jumped effortlessly out of the pages of the book seemed pacified and less beautiful on the silver screen. The passion and life of the main character seemed to fall apart in the movie, which left me with a simple image of just one woman trotting around the globe rather than an inspiring journey of discovery. "People think a soul mate is your perfect fit, and that's what everyone wants. But a true soul mate is a mirror, the person who shows you everything that's holding you back, the person who brings you to your own attention so you can change your life." PS: The photos in this post are not mine but have been borrowed from other sources. Lovely and inspiring post May. When i saw you yesterday I could tell you are definitely in that path towards inner happiness . Good work May Loh . Thanks sweety! :) I felt so inspired by the book that I felt I just had to write a review on it! Also thanks for the follow back....hope you've had a great Lunar New Year! I haven't read the book, I only saw the movie at the cinema, and I liked it. Me and books never had a good relationship >.< lol. Lol....I just love reading.......but I suppose nowadays there are audio books and kindles so it makes reading more fun! So please do try to give this book a go if you ever get the chance....its a really good story. Great post and recap!!!! I actually haven't finished the book yet, despite that i bought it last year in March!!! LoL...but you have reminded me to go back to this book, thanks=)For some reason,i found the beginning really interesting and inspiring until she got to India then i started slowing down. And i agree, Juliet Roberts really failed to capture the character that i built in my mind whilst reading the book. When i watched the movie, i really just felt like i was watching a woman travelling around the globe.But i do think books tend to be better than their movie version. Wow, you do yoga? That is amazing! I only tried it twice during my gym membership as we had free classes for it, and i was told i wasn't "flexible" but that it could be worked on, lol. I'm sure you are super flexible, hehe. Please do finish reading the book if you get the chance and yoga is definitely worth trying! It is so much more than just flexibility....it works on the body as well as the mind. Really good for relaxation, solving aches and working on breathing. I am not that flexible either as I only do yoga once a week by myself at home, but I feel better afterwards and it usually relieves any aches, pains or tiredness. ps: You are most welcome and I am glad that I did reach out to you.